There was once a time I used to think mists or facial sprays are a pure waste of money. I was proven wrong by Benefit Ultra Radiance Facial Re-Hydrating Mist once and for all. And then I looked for more.. 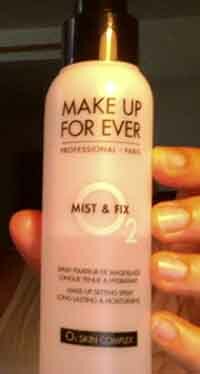 The Make Up For Ever Mist & Fix O2 is designed as a setting spray, which is long lasting and moisturising. The label on the box says that. However, I use it as a base as well as a make-up setting spray, and sometimes can’t decide which is better. I actually found this one when I was searching high and low for my usual fav Benefit Facial Mist. Again the shopgirl in Sephora came to my rescue (thank you, Sephora!) who suggested the Make Up For Ever Mist. I was reluctant to buy it because it was clearly written to be a “make up setting spray” while I wanted a mist that I used as a quick re-moisturising spray as well as a base in lieu of a toner. The Sephora lady was adamant. I am usually stubborn in these kind of things, but turned out, she was more mule-headed than I can ever be. She made me try it out while shopping and truth be told, I was hooked. I like to write the negatives so that the positives stay with you more. So here goes.. I like the plastic bottle it’s in. I like the feel of it when I spray it on as a base toner, or over make up. However, I really do wish it had a better spray nozzle. I usually hold it at least an arm’s length away from my face to use it. And even then some areas of my face are more soaked than others. It just doesn’t spray even. I love it. I’m hooked onto it. If I have to compare it with the Benefit Ultra Radiance Facial Re-Hydrating Mist (check my review here! ), this one tends to feel a li’ll bit heavier than the Benefit mist. But still, it works like a charm as a setting spray. The “freshness” of the spray tends to stick with you far longer, and yet it doesn’t feel sticky. Recently I had more than my usual share of nights wearing make up and in the sweltering heat, this mist helped me a lot. So that’s why my absolute thumbs-up. Enjoy! DISCLAIMER: This is not a paid product review. This review is based on Ankitaa’s personal experience.